At Elitis, we supply the Notus BSC 94 sliding patio door from AluK. The Notus inline sliding door system is available in single, double, and triple track options with the option of both fixed lights and sliding doors. Its unique design and high-performance hardware create a door which provides an effortless and consistent operation in any application. The Notus BSC 94 is suitable for a wide variety of applications. From new build and refurbishment projects to light, medium, and heavy duty commercial installations; the Notus is an excellent solution. It has been installed in hotels, office blocks, schools, colleges, and low, medium, and high-rise apartment buildings. Its versatility and excellent functionality make it a popular choice for homeowners and businesses alike. The Notus BSC 94 patio door is one of the highest performing patio doors on the market. Under rigorous testing it can achieve Air Permeability – 600 Pa, Water Tightness – 2000 Pa, Wind Resistance – 1600 Pa, and U-values as low as 1.7 W/m²K. It features a multi-point locking system for enhanced security and a cloaking feature which conceals the lock and prevents access to any locking points. Aluminium patio doors from Elitis are available in virtually any colour. You can easily colour match frames for a uniform aesthetic and once coloured, the finish won’t peel, fade, or corrode. 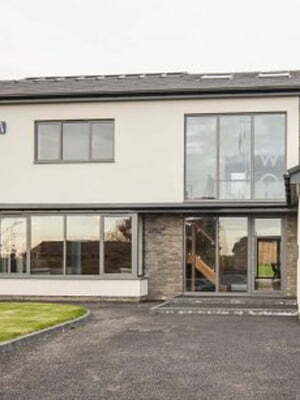 Aluminium is an extremely low maintenance and durable material. With only the occasional wipe down it will stay looking new for years to come.